This is a pair of old shoes I had lying around.. I felt they were a bit boring so I rarely wear them. hehe… I think a lot of people have a similar problem, there are always something we don’t want to wear / use, but we are reluctant to throw it away or be wasteful. It is a good idea to give them a new birth with alterations and decoration! All we need to snazz up these shoes is some lace, two heart-shape cabochons, and some pearls. 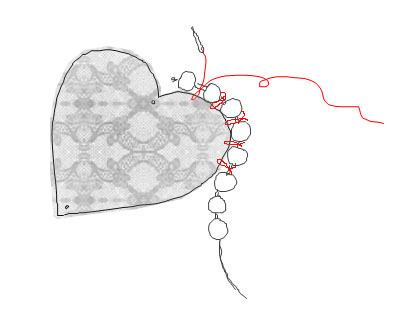 First, wrap the heart-shape cabochons with some lace and sew it tight at the back. Then, string up the pearls and sew them around the cabochons. Sew some pearls on the ribbon (or shoe!) randomly. Finally, stick the cabochons on the ribbon. A little decadent ball of sweetness that lives for diy, kawaii and web logging. She lives in Hong Kong, the center of it all. Everything she touches turns adorable. What’s So Fake About You? That is one brilliant idea!!! I would add that on other shoes, you could use earring clips as a deco too. hehe…Sarah, i draw that process in detail, see if you can understand by this pic? So cute! I’ll have to try this technique some time. Very cute, I always wear sports shoes, and seldom have such cute shoes. I hope to get one. But sports shoes are really comfortable.